A common misconception in following a spiritual life is the belief that in order to follow the practice that one must live in a cave, wear a saffron robe and beg for alms. This picture of a monk with a shaved head living in the mountains leads one to believe a spiritual practice is not possible unless one practices asceticism. This commitment level and practice is too much for some so they refrain completely from practicing a spiritual life. This all or nothing mentality creates a missing in a person’s life. It IS possible to have a spiritual existence without a shaved head and bamboo cup. Many masters in India as well as spiritual practitioners across the globe live a regular life with a family, and a job. How is such a life possible? The essence of living a spiritual life is contained in the Zen quote “when hungry eat, when tired sleep.” Now before your mind reacts and you say to yourself….’Gee thanks for that incredibly obvious piece of wisdom.’ Look at this quote more closely, along with the initial passage above ‘before enlightenment chop wood, carry water…after enlightenment chop wood, carry water.’ Break life down into the simplicity of the present moment. As human beings we do not live in the present moment. We carry our past forward with us, we yearn for something in the future and all the time we miss what is in front of us at all times. Life is beautiful right in front of us at every moment. Focusing on this moment right now removes the mind from drifting to wants, needs, desires….all driven by the mind in search of attachment. With attachment comes suffering. When I am in the mind-set of when hungry eat, when tired sleep I am fully present to the simple needs I actually have to survive and I am present to life AS it is happening. I can see a child’s smile across the park. I can see the bird in the tree. I can smell the lilac tree as I run by. I can feel the rain on my skin and the presence of the divine in every moment. In the early days of the Zen monasteries, the number of monks grew to the point that it was necessary to split up tasks, chores throughout the day to keep the place running. It was impractical to have all sit in meditation all day as there was upkeep and food needed. The practice of meditation while awake and doing chores was brought into practice. This practice was a supplement to the actual sitting meditation with the intent to find PRESENCE at all times throughout the day. Do not let your mind wander. Bring it forth to the present moment be it listening to another, focusing on a task, or going for a walk. The simplicity of a spiritual life is available for anyone, no shaved heads required. It involves staying present, getting the mind under control, practicing love and compassion. Clear your mind….Chop wood, Carry Water. Create the distinction within yourself that YOU are a SPIRITUAL BEING. Once you declare this then you will look for actions consistent with this way of being. Stay present with what you are doing at all times. Be with people, Be with your task. Multitasking is overrated. It takes away from BEING PRESENT. Don’t miss this wonderful blog post. It’s been some time that I live like that: “when hungry eat, when tired sleep”, and I like being like that. What made me feel guilty about it is my therapist who considers that being “passive”. She used to try and provoke reactions, she wanted actions and reactions to everything happening. where is the limit between being Spiritual then and being passive? PS: I may want to quote it, ok? I love this post. I’m learning to practice mindfulness in my life and I am sensing a calmer sense of being. I call it taking a step back, taking a breath, and bringing awareness to the moment. Thank you for this article. Simply brilliant and beautiful post. Reblogging this on Zen Being with much gratitude. All the mundane chores of modern life, and of olden times are reasons to get up each morning. The most miserable, depressed people are often those who can’t be bothered to get out of bed, open the windows, go to work, fix something nourishing, care for a garden, empty the trash etc. 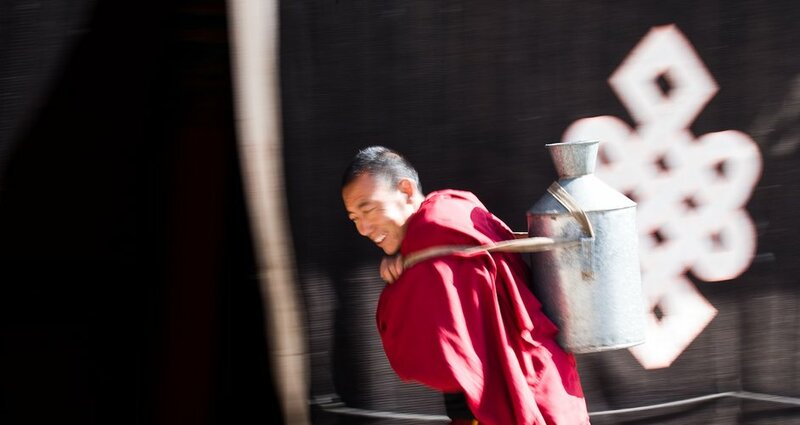 To cycle through these chores can seem endless, and meaningless. Yet this is the stuff of life. It is an illusion to think “if only I had ————-, I would be happy. It’s ok to let ones mind wander while completing tasks that don’t require ones full attention.”Be here now”, but go ahead and daydream. Do not lose sight of the fact that YOU ARE NEEDED to carry on the tasks of everyday life. Your house needs your attention, so does your garden, your loved ones, your community. You don’t have a house, garden, loved ones, community? You want to win the lottery to buy these things and hire others to do the work? You will never be content. Read “The Giving Tree” by Shel Silverstein. It’s about more than trees. It’s about the bored, oftentimes greedy “boy” in all of us who just wants to be happy. Thank you, Zen Revolution, for a magnificently simple and beautiful post on Mindfulness Practice. I thought you might be interested to know that dilipnaidu (http://dilipnaidu.wordpress.com/2012/05/03/weekly-inspiration-a-zen-quote/#comment-2789) re-posted my re-posting of this post. So inspirational!! Thanks for a fantastic blog; I’m adding you to my Blogroll. When I thought I felt lost in the routine of life, I found this one to tell me life is just as it is supposed to be. This moment onwards I shall try more to focus on the present. This is great, thank you so much and thank you for who you are. I checked out your site…looks good. Keep being happiness and love. what a load of crap. Sounds like something a person would tell another in order to get them to shut up and get a job done that they dont want to do themselves so they trick someone else to do it mindlessly. Thank you for your response, I appreciate your passion. With respect to your comments, there is no motivation to coerce another individual. In fact, the journey is about internal self discovery, never about dictating to another on how to do things. No tricks, no coercion…in the moment, present to the NOW. Thank you again for your words. Coincidentally, I read your article. A similar kind of argument breaks out between my two friends….Now I got the answer from your article. You have made the wisdom more candidly…. Glad I could contribute, thanks for posting. Just curious, what was the argument? What does this proverb mean ? Before Enlightenment, chop wood, carry water. After Enlightenment, chop wood, carry water.”? Hello….do you still feel you wish to discuss the proverb? I found that on https://practiceofzen.com/tag/mountains-and-rivers/ and someone I know suggested that it might have been the original version of this. This post reminds me of one of my favourite books One Hundred Days of Solitude by Jane Dobisz in which she spends each day filled with the simple acts of meditation, repeating mantras, tasks like chopping wood, collecting water from the nearby spring and bringing her fast paced western ‘outside’ life down to the very basics for 100 days living in a cabin in a wood.